Delta Air Lines has introduced a new wine menu on its routes between the US and London Heathrow. The carrier’s new selection is exclusively for its Business Elite passengers. 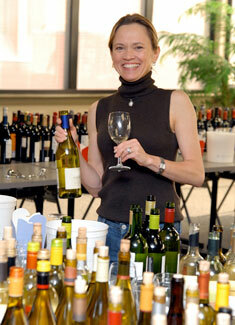 It features two red and two white wines from wineries in France, Italy and California. The wines have been selected by Delta’s sommelier Andrea Robinson (right). The red wines are: Decoy Pinot Noir, Sonoma County – California 2012; and Château Cantemerle, Bordeaux – France 2011. The white wines are: G de Château Guiraud, Bordeaux – France 2013; and Beni di Batasiolo Langhe Chardonnay Serbato – Italy 2013. Robinson said: “Customers on Delta’s London routes appreciate fine wines and I’ve selected two of my favourites from the Bordeaux region and two sensational wines from Italy and California to start our exclusive wine programme in style. Delta said it will update the wine selection each quarter. Business Elite passengers can also choose from Champagnes, ports and dessert wines on all the airline’s international and trans-continental flights. Earlier this month, Delta announced it had started serving Starbucks coffee on every flight (see news, February 9). On March 1, the carrier will implement five fare options for passengers to choose from (see news, December 10).